CIE's distance education Wireless and Electronic Communications course was designed to provide a thorough understanding of Wireless and Personal Communications along with providing a solid core of instruction in electronics. CIE's Wireless and Electronic Communications program explores important theories and principles related specifically to communications, but because it does not contain any laboratory work, it is best suited to those students who already have some previous education or practical experience in electronics. FCC (GROL) Review Lessons and more! Wireless and Electronic Communications (course 4) contains 84 lessons with instructor support. Our instruction staff works directly with you one-on-one to answer your questions and provide you with technical assistance when needed. You can take your exams online with our e-grade site or simply mail them in to us. This program was created specifically for the distance learning student. Experience a step-by-step method of learning that allows you to master the fundamentals and move on to more advanced topics! Students graduate with a Diploma in Wireless and Electronic Communications. CIE has been teaching students via distance learning for over 80 years. Wireless and Electronic Communications also includes a study guide on how to prepare for the Associate-Level Certified Electronics Technician (CET) exam. This test is administered by the International Society of Certified Electronics Technicians and has over 46,000 certified technicians across the globe! Certification enables employers to separate knowledgeable job applicants from those with less training and skills. CIE has an open enrollment policy and you can start this program at anytime. One of the advantages of enrolling with CIE is that you can study at your own pace. Some students go through the program slowly, others at an accelerated level, but on average most students complete about two lessons a week. We can accommodate almost any arrangement that suits you best and with our generous time allotment of 24 months for Course 4 you can be assured to have enough time to complete your program. 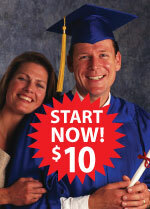 Enroll on-line in Course 4 for only $10 down. Lesson titles for the Wireless and Electronic Communication.